The process to restore the door hardware in Mr. Madison's room was similar to the process used to restore the hardware in the North Passage. The surviving ca. 1812 doors were inspected for traces of the original hardware under raking light and the paint over the original lock was carefully scraped down by hand to reveal any surviving evidence of the door's hardware. 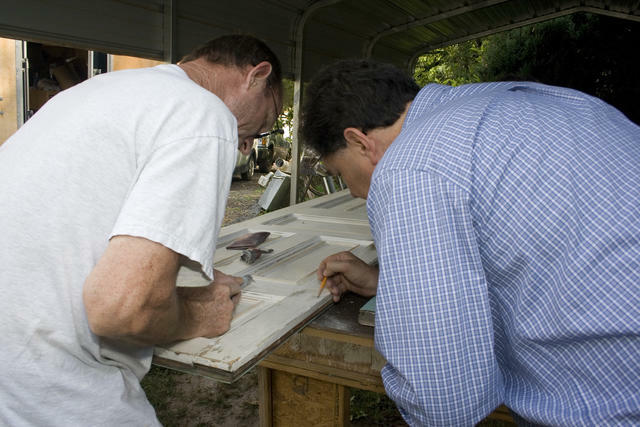 Architectural historian Mark Wenger and a painter search for evidence of the original Madison-era door hardware.